ESPN loves them some Vince Young. Every personality, analyst and announcer on the channel sings his praises every single chance they get. And why wouldn't they? He's talented, successful and a very good quarterback. Except one thing. He's not. At least, not yet. 7 weeks into his second season, his QB rating is a dreadful 66%. He's thrown twice as many interceptions as he has TD passes. His yards per attempt is a pathetic 5.82 and even his rushing yards per attempt is an un-Vick-like 3.6. Yet according to ESPN analysts, he's having a "so-so start." He's a "winner" which is their way of saying that he should thank his defense and running game for carrying him. Another "winner," "gamer" and my favorite euphemism, "warrior," is Brett, "His Lordship," Favre. The past couple of years, (before his renaissance this year) Brett Favre was mediocre at best. And "mediocre" is being kind. Still, to John Madden and every football announcer near a microphone, he WAS football. "...rooting for Brett Favre is like rooting for America." Despite Favre's QB rating the last two years hovering near 71, and his having become the living embodiment of an interception, praise was endemic. This year with Lord Favre playing well, sports analysts are practically drooling when they talk about His Lordship. Chicago Sun-Times columnist Jay Marriotti said this doozy: "The rebirth of Favre is bad news for Bears fans. But it's great news for football, sports and, when you think about it, life." Favre Fan Club Member #1, John Madden, has another crush aside from Mr. Favre. In 2002, he said that if he had one player to take, to start a franchise, it'd be Randy Moss. "The best receiver," "most talented," "best hands"...blah, blah blah. 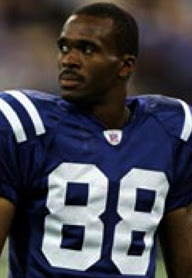 The same year Madden said that, Colts receiver Marvin Harrison broke the record for most pass receptions for a season with 143. Truth be told, he didn't break it; he demolished it—the previous record...Herman Moore with 123 catches in 1995. He broke the record by 20 receptions!! That would be like someone breaking Bonds single season home run record of 73 with 93!! But you didn't see Harrison on the cover of Madden 2003. Or 2004 or 2005. If you're a regular watcher of ESPN, you'd think Cincinnati receiver Chad Johnson has that record. Or at least caught 100 receptions in a season. (He hasn't.) You'd think Terrell Owens had the record for most yards gained in a season, and not Jerry Rice. Or that Terrell had any record of significance. Or a ring. What gives? Why is it that broadcasters and analysts fall in love with some guys and other guys can be the second coming of Jim Brown and yet be ignored? When did sports reporting and analysis become a high school-esque "It Club" where some athletes are consistently praised despite what they do on the field, and others are damned to cliche reporting. Or at best, indifference. You know who is one of the most well-rounded defensive ends in the league, stout against the run and is second in the league with 8 sacks? Aaron Kampman. Only serious followers of football would know that name (or if you happened to have season tickets to Packers games). Why? Why isn't he championed by CNNSI? Where are the reports on Sunday Morning Countdown, the replays of his tackles or sacks? Why are all the accolades on the Packer's resurgance this year heaped at Lord Favre's door, and none for the defense led by this Pro Bowl defensive end, named.....what's his name again? Who has the most tackles in the league? Pssst. It's not Ray Lewis...who you'd think was paying ESPN for everything they say about him. It's Barrett Ruud. Who has more catches, Randy Moss or Wes Welker? Give you a hint, it's not Moss, despite however many One On One interviews he gets on the Sunday shows. There are many nominees for the "MARVIN." Wes Welker, who we mentioned, is the engine that drives the Patriots attack. Welker has 56 catches, most of them tough middle-of-the-field receptions. Elvis Dumervil, David Garrard and Jason Witten were all considerations. But the MARVIN is presented to....Jared Allen. Defensive end Allen has 8 sacks so far, which is fantastic—on pace for 17 sacks for the year. What's even more fantastic is that he missed the first two games of the season, so those 8 sacks have been gotten in 5 games. He also is leading defensive linemen on his team with 26 tackles and 2 forced fumbles. The first two games, when he was out, the Chiefs' record was 0-2; since he's been back, the Chiefs are 4-1. Congratulations Jared on your MARVIN award! Which leaves the nominees for the FAVRE. There are many. Ray Lewis, who we mentioned, isn't having a bad year, but not the year you'd assume from listening to commentators. Same for Chad Johnson. Reggie Bush was REALLY tempting, but in the end, there was really only one choice. Actually the award really goes to ESPN, the Sunday morning NFL shows and sports radio. 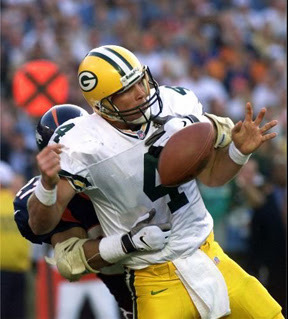 The FAVRE isn't necessarily a knock on a player (most of all Brett himself. Brett is a good guy and a great player). It's a comment on the strange infatuation certain players seem to incite in commentators and analysts and the virtual anonymity other players have. And the man-crushes don't just occur in football, it goes for all sports. Jose Reyes could someday be a winner of the FAVRE while Placido Polanco is a strong candidate for the MARVIN. One last thing. The FAVRE and MARVIN aren't annual, rather whenever this blog feels an award is due, we'll just give it out. So vote early and vote often.